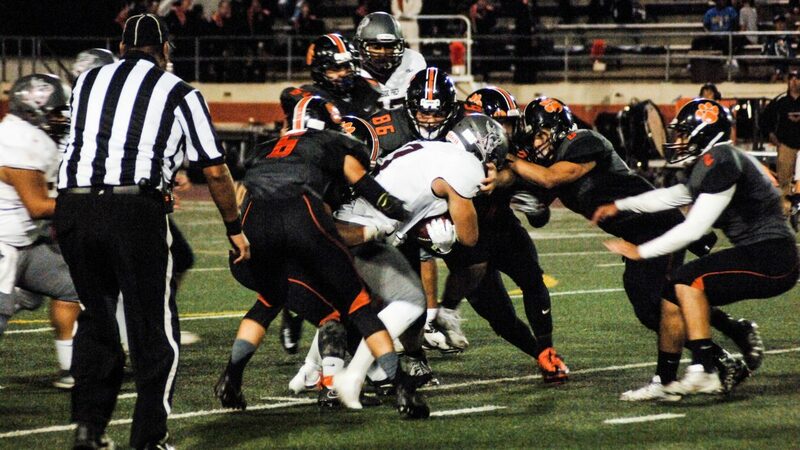 South Pas' blanketing defense tackles a Riverside Prep player. South Pas varsity football continued their non-league dominance, beating the Riverside Prep Silver Knights by a score of 55-6. The Tigers advance to 3-1 on the season, with just one preseason game remaining. Riverside Prep, located outside of Victorville, made the 82 mile trip to South Pasadena only to be handed a lopsided loss under the Friday night lights. The Silver Knights, who are now 1-2-1 on the year, were outmatched by the Tigers in all aspects of the game. Senior Gavin Chi follows blockers through the Minute Men defense. South Pas got off to a quick start, as a long opening drive, culminated in an early touchdown pass from Justin Huff. The junior quarterback tossed a beautiful lob pass down the sideline to senior wide receiver Sydney Luna-Long. Luna showcased his playmaking abilities once again in the first, making an acrobatic dive into the endzone to put the Tigers up by two scores. The rejuvenated passing attack kept adding to the lead in the second quarter, with a long touchdown pass to senior Danny Rios. Senior Jackson Totleben completed the offensive onslaught with two touchdowns of his own, including a 47 yard run to ice the game. Senior Thomas Avila led the Tigers defense with two interceptions, one of which he returned for a touchdown. Coach Brandon Wilson’s defense was up to the task once again tonight, neutralizing both Riverside’s passing and running games. Luna, former quarterback, excelled in his new role as wide receiver, leading the Tigers with three touchdown receptions. Coach Jeff Chi expresses his opinion about Luna-Long’s performance in the blowout win. “He brought a spark tonight. Every time he touches the ball, he has the opportunity of getting a touchdown for us,” Chi said. South Pas will travel to Alhambra next Friday, September 23. Last year, the Tigers defeated the Moors 17-14 in a tightly contested game.